The Alcat Test for food sensitivity is based on leukocyte activity in the presence of food antigens. Despite the widespread clinical application of the Alcat Test, the cellular and molecular steps responsible for a positive test have not been identified. We quantified activation markers on peripheral blood lymphocytes from healthy volunteers in response to severe intolerance or no reaction foods on the Alcat Test. We hypothesized that positivity on the Alcat Test is associated with up-regulation of plasma membrane markers on peripheral blood immune cells. Reactivity of peripheral blood lymphocytes from 10 volunteers to 200 antigens was determined by Alcat Testing. On a subsequent day, peripheral blood lymphocytes from the same volunteers were exposed to a single severe intolerance and no reaction food extract, or left untreated. Six samples met technical criteria for successful FACS analysis. 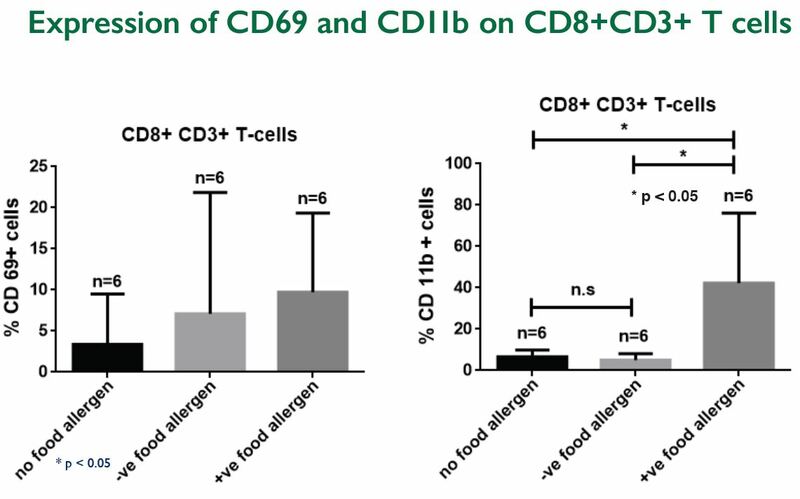 Activation marker CD11b was significantly increased in both CD4+ and CD8+ T cells after exposure to severe intolerance antigens. 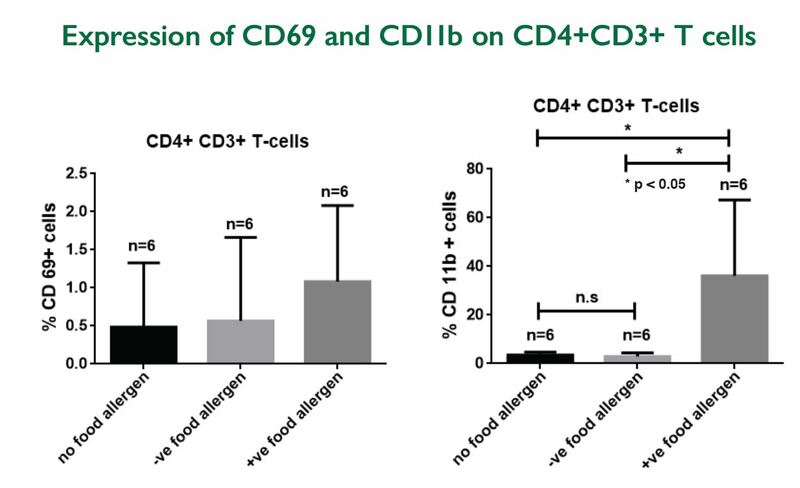 In CD4+ T cells: 3.5% of untreated cells were CD11b+, 2.9% of cells exposed to no reaction foods were CD11b+, while 36.2% of cells exposed to severe intolerance foods were CD11b+. 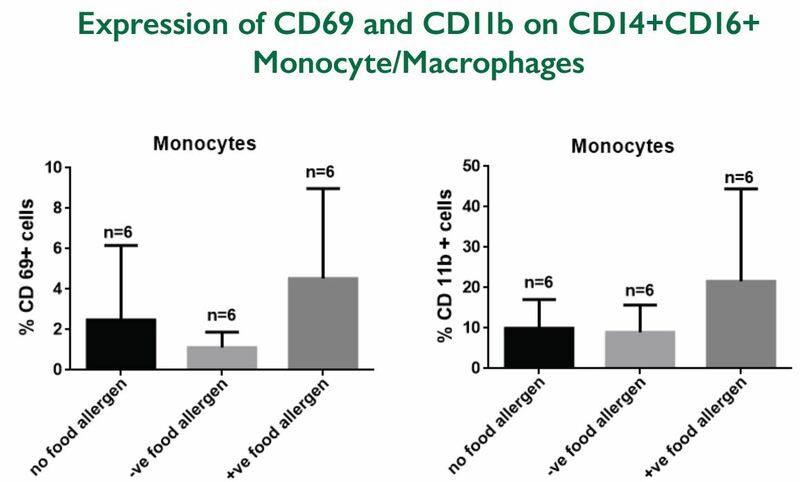 In CD8+ T cells: 6.6% of untreated cells were CD11b+, 5.1% of cells exposed to no reaction foods were CD11b+, and 42.3% of cells exposed to severe intolerance foods were CD11b+. These relationships were statistically significant at p=0.05. Other activation marker associations did not demonstrate any significant differences. Severe intolerance on the Alcat Test is associated with an up-regulation of CD11b on CD4+ and CD8+ T cells. This study provided detailed analysis of well-characterized cell populations, but was limited to a single time point of analysis. Identification of activation markers can provide a biological understanding of food sensitivity, and may form the basis for more targeted clinical management. We will be testing if severe intolerance on the Alcat Test is associated with degranulation of neutrophils. We will be testing if severe intolerance on the Alcat Test is associated with activation of the inflammasome pathway in human peripheral blood monocytes. We will assess the clinical efficacy of personalized dietary advice (based on Alcat Testing) vs. control dietary advice in a randomized controlled trial in 58 adults with irritable bowel syndrome. We will correlate findings from these experiments to clinical outcomes in study subjects. We thank Theresa Weiss, MPH for her support and contributions. Grant support from Cell Science Systems Corp. (Florida, USA). 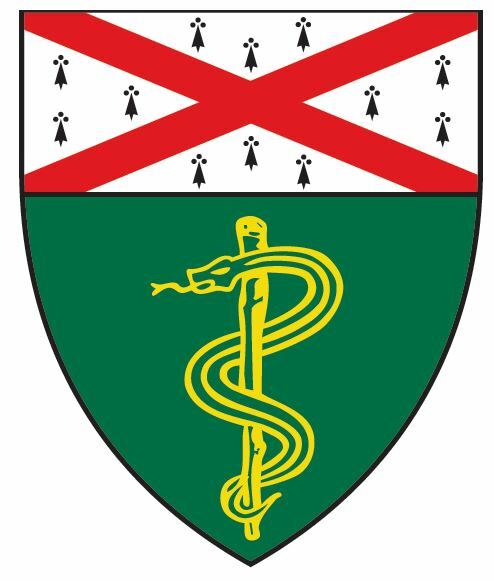 This study has been approved by the Yale University Human Research Protection Program/Institutional Review Board for research involving human subjects.